First things first; we can agree that garbage is a threat to our environment, to our safety and our overall health. That said, garbage and waste, especially in places where we live or work, can be quite a nuisance if it is not dealt with in the shortest time possible. Moving on, the kitchen is always the most affected area in our homes and this is because off all the food waste. This makes waste disposal at home the most taxing and frustrating thing to do, especially if you do not have a good waste disposal plan. To make matters worse, garbage disposal in Abingdon has become quite a problem due to the increasing population. Not to worry though; this post is meant to shed some light and help you dispose your waste easily. So other than hiring someone to collect and dispose your garbage, you can now invest in a garbage disposal unit. This is basically a device that is designed to shred food waste into tiny pieces; pieces that won’t clog the drains and pipes. Once you have purchased your waste disposal unit, be sure to call in a professional plumber to assist with installation. The plumber will mount your disposal unit under your sink so that any waste that goes through the sink drain is shredded into tiny bits. However, as easy as this may sound, there are certain wastes that should never go through the disposal unit. For example, bones, coffee grounds, foods with fibre like celery, pasta, glass and metal should never find their way into such a waste disposal unit. Such wastes should always go to the trash can. A lot goes into taking care of a waste disposal unit even with the fact that a good unit can serve you for a few years without need for repairs or servicing. Keep reading for some useful tips that you could use to extend the lifespan of your waste disposal unit. · Run your garbage disposal regularly – Instead of waiting for your garbage disposal unit to overflow with waste, make it a habit to run the disposal on a regular basis. 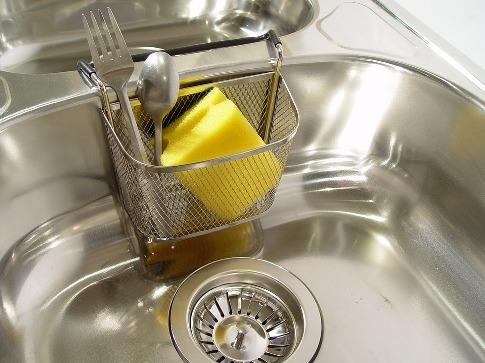 · Use cold water – Most of the time, the food waste that we put on the drains is oily and greasy. By using cold water, the food waste is solidified; and this makes it easy for the disposal unit to shred the waste. · Grind before turning off the unit – Ensure that you are done grinding the waste before turning off your unit. And in addition to this, do not turn on the water until the grinding is finished. Once you put off the unit, you can now let water flow for about 15 seconds. · Dispose some orange or citrus peels – A lot of waste goes down the disposal unit and a lot of debris or bad odor could be left behind. To keep the unit smelling fresh, throw in some orange or citrus peels. They will not only leave your unit smelling good but they also act as a disinfectant. Well, there you have it all. It’s time you kept that kitchen clean and free of any annoying odors.